Life doesn’t always work out the way you planned. You’ve gotta be flexible and roll with what comes at you. Take today for example. My laptop punked out on me so I’m typing this blog post on my husband’s computer. Another example happened this past week on our first ever Maven Roadtrip! As you’ll learn, there are five Mavens -- Jen, Erika (that’s me! ), Kina, Stacey and Jess -- and (in this circumstance) adorable mini-Maven, June. We are a group of friends. 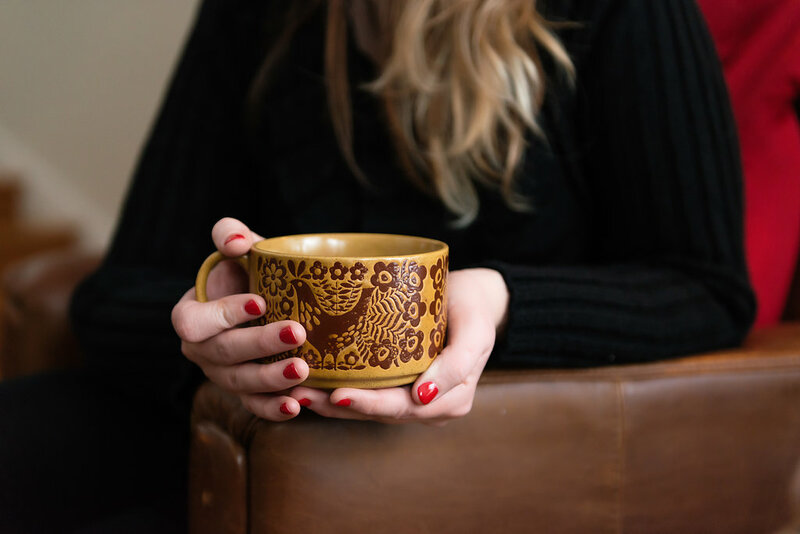 Creative women who happen to be moms, and who are determined to live our best lives. Jen and Erika discuss the finer points of June, Jess and Kina's masterpiece. Stacey snaps a pic for posterity. This blog is about us. Our adventures exploring Ontario, Canada and the world. Creating beautiful memories with our little ones. Building creative businesses and helping each other every step of the way. To kickstart our new project, we synchronized our schedules and made a hasty plan for a road trip on Wednesday. 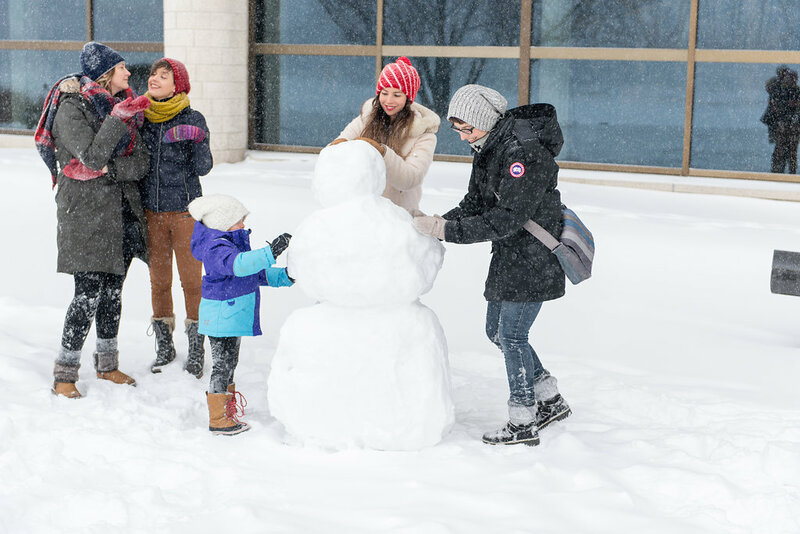 We wanted to go to Winterlude, the Ottawa-Gatineau festival that celebrates all things winter. And we sure got winter! 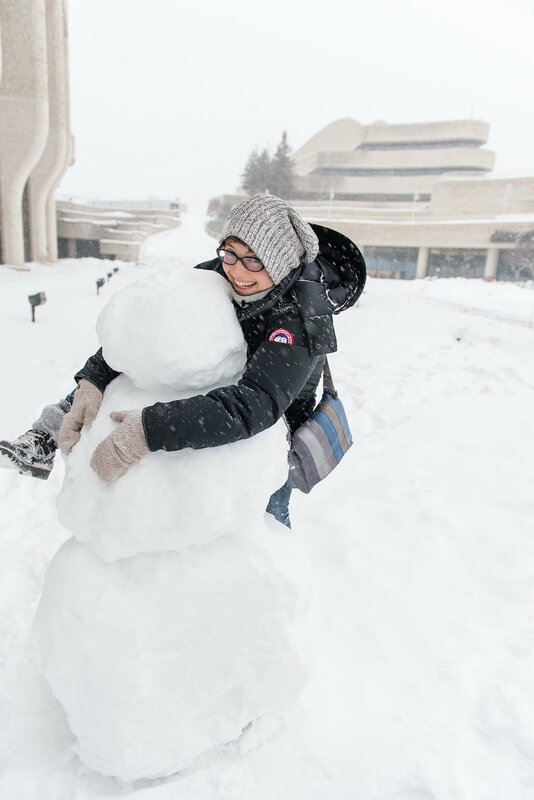 The morning started with a veritable blizzard that was deemed a snow day for local schools. 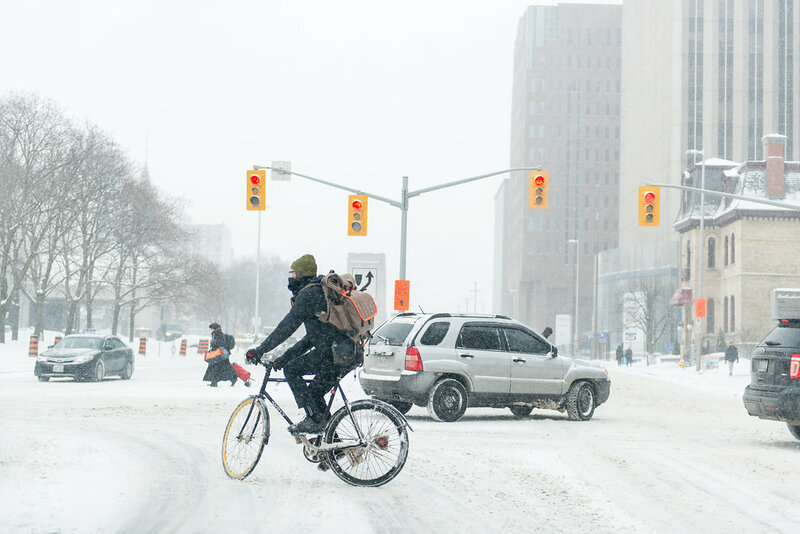 This cyclist earned massive respect from the Mavens. With the school-age mini-Mavens dropped off at school, our three-car caravan inched down Highway 416, arriving in Ottawa a smidge behind schedule when ...oh my gosh, poor June was carsick! No big deal. We pulled into a Starbucks, did a little cleaning, and were back on the road in no time. June felt better after a snack and we had coffee! 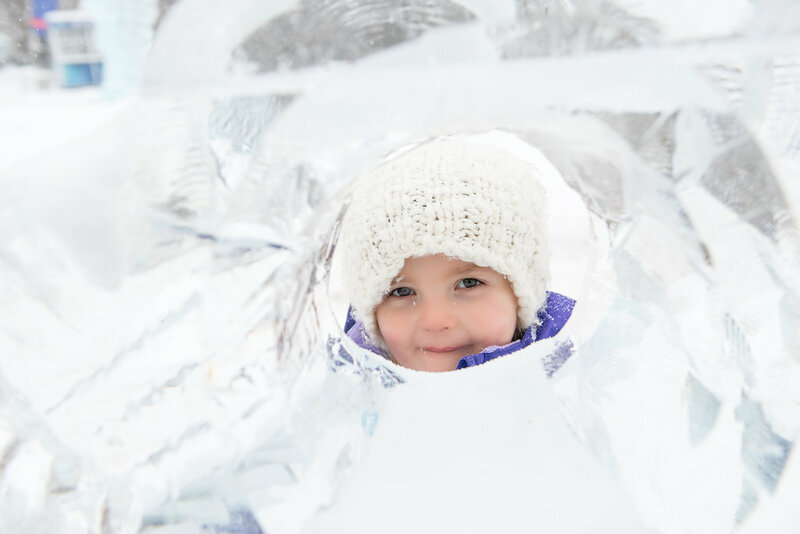 The plan was to explore the Snowflake Kingdom in Jacques Cartier Park in Hull -- the winter playground Kina remembers visiting as a kid. But as we drove by, the park was decidedly closed and completely deserted. Just another obstacle to overcome. No point stressing about it because just down the street is the Canadian Museum of History. We parked the car and got out to explore. 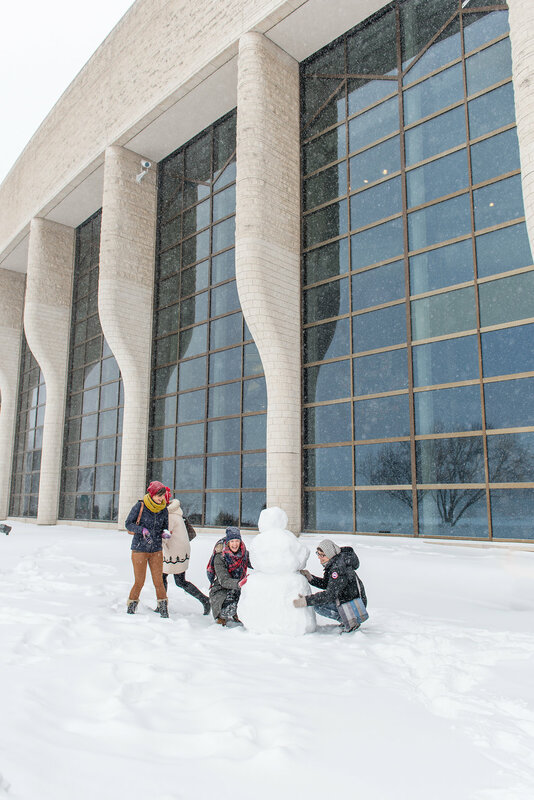 We took a snowy stroll around the Museum grounds, pausing to build a snowperson (or at least take credit for it!) 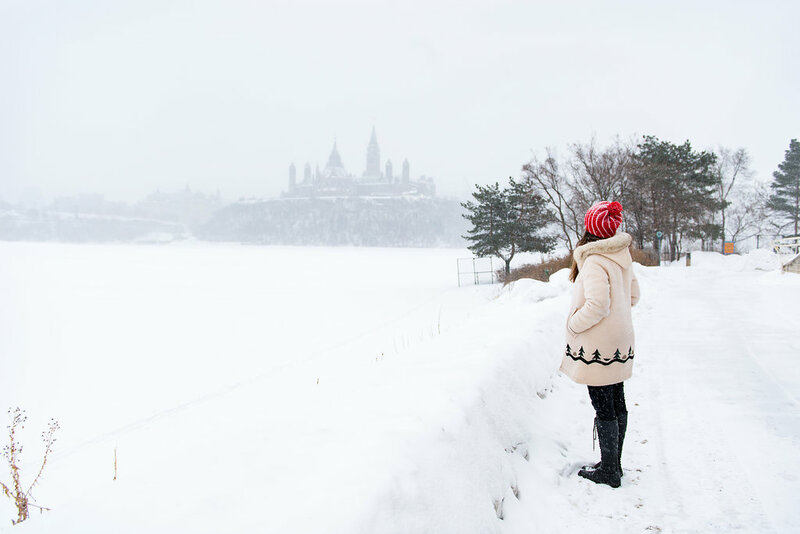 and gaze across the Ottawa River to try and make out the shape of Parliament Hill through the thick snow. Nice “view” of Parliament Hill… it’s Jess’ coat that’s the real winner here. We sure do great work… what creativity! Kina goes the distance for the perfect shot. 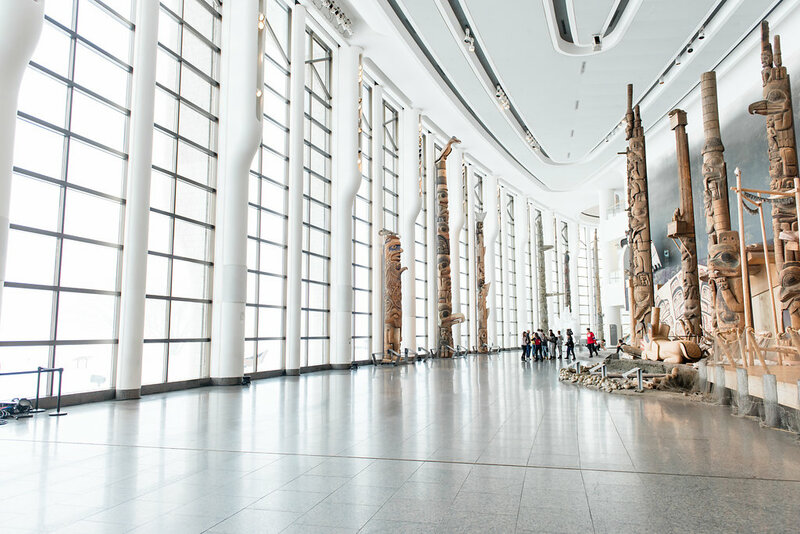 Towering totem poles oversaw our descent as we took our first steps into the exhibit. 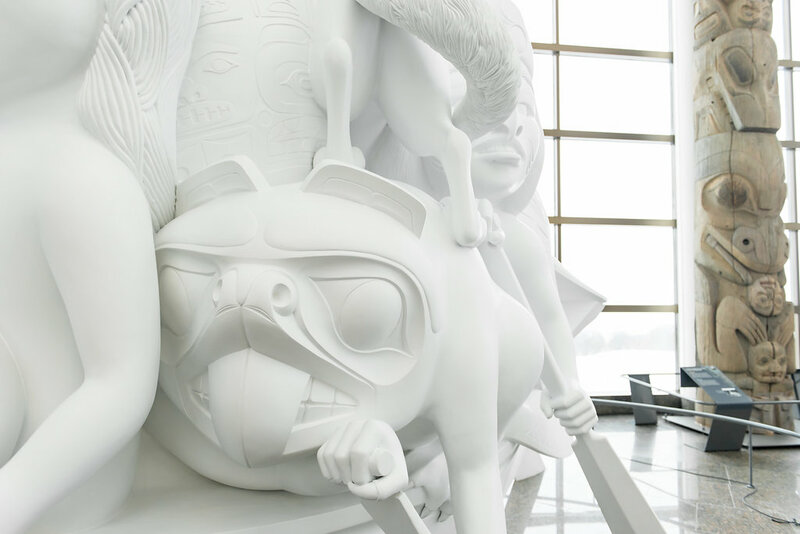 We gravitated toward the sublime white plaster for Spirit of Haida Gwaii by Bill Reid and then lay on the floor to take in Morning Star by Alex Janvier. Yep. 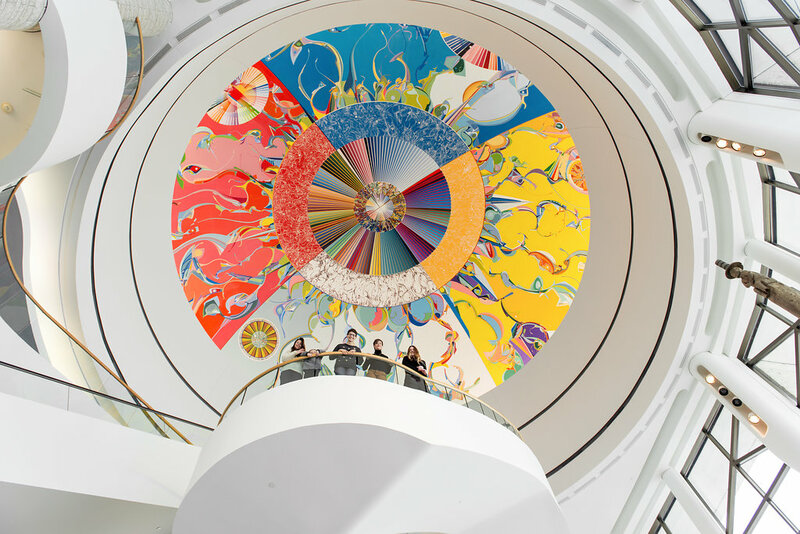 We lay on our backs to look up at the 19-metre dome that rises seven storeys above the Great Hall and bears a stunning multicoloured abstract painting, which is divided into four quadrants. As we stood, we noticed there were chairs designed for sitting back and observing the masterpiece. Oopsies. 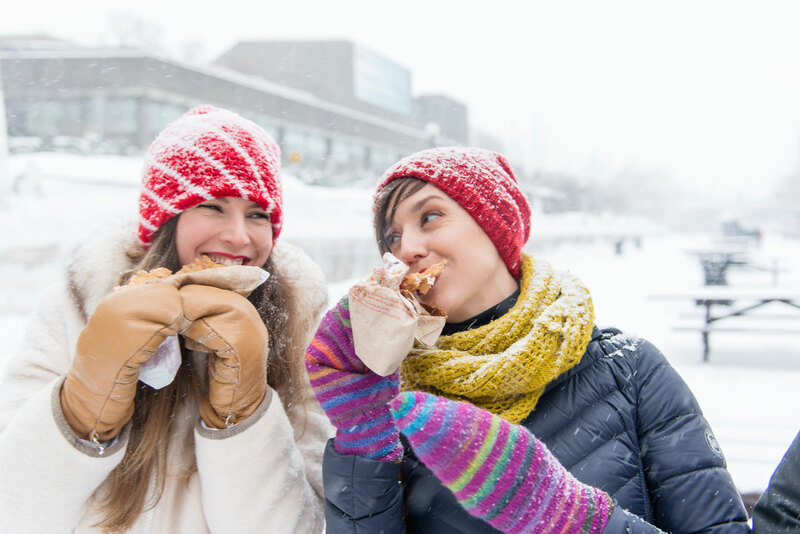 ​At this point, the Mavens started to get hungry, so we packed up and crossed the bridge to Ottawa to indulge in some Winterlude treats. 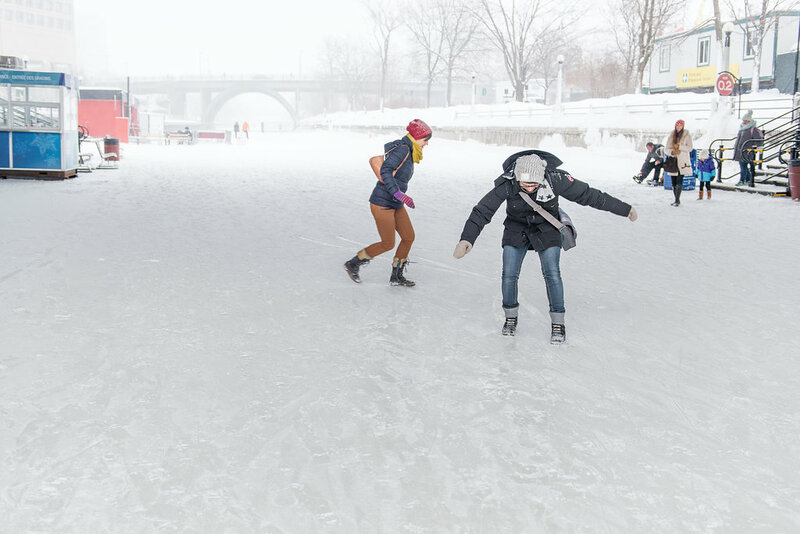 We tromped down to the Canal -- aka, the world’s longest outdoor skating rink -- to get our sweet, sweet cinnamony fix. Enjoying the canal "sans skates"
While you could technically visit a BeaverTails® stand off-season in a mall or whatever, something about that feels very wrong to me. 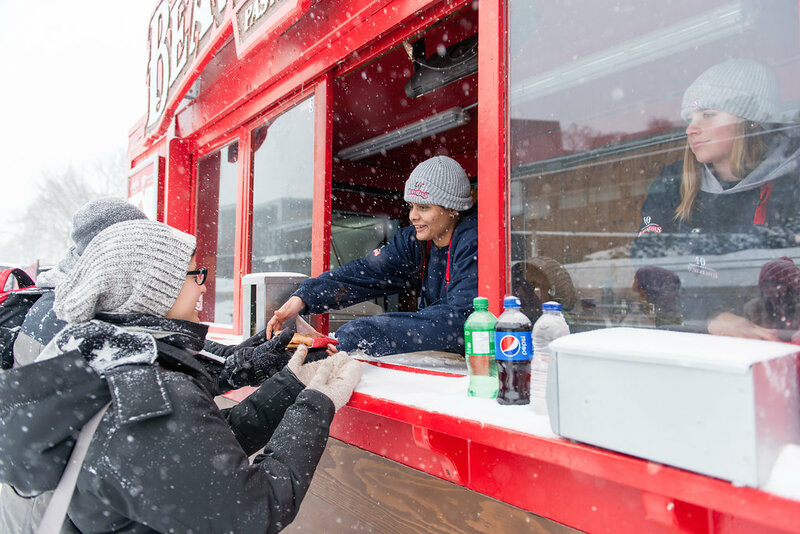 You get BeaverTails® at Winterlude and that’s that! On really cold days, the thinner edges freeze a little and get crunchy, but the middle stays warm and soft and comforting. Yum. Pairs well with hot chocolate and a bright blue sky. ​We all got the Killaloe Sunrise, in which the pastry is dusted with cinnamon and sugar, then drizzled with fresh lemon juice. It’s a showstopper, and many more talented food bloggers have waxed poetic on this treat. Trust us. Trust them. Bring napkins. 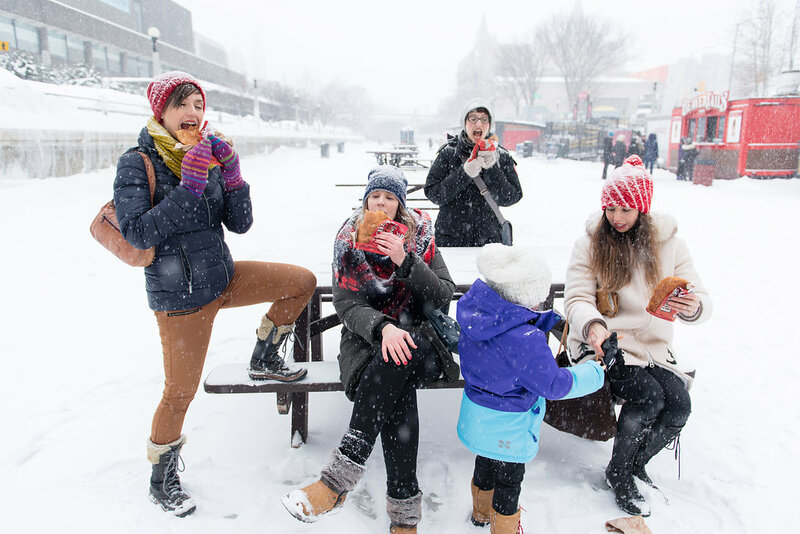 Haven Mavens eating Beaver Tails® - Erika doing the "Riker", Jen mostly focusseed on the dough, Kina with the perfect "om nom nom" face, ​June is puzzled about eating outdoors on a snowy picnic table with no plate, Jess is trying to convince here that this is all perfectly normal. At this point, our little trooper June started to break down. Our mama instincts kicked in and we started checking the time. It was getting late. We had to pick up the kids. Time to wind down the road trip. As we drove home, we stopped in at Jess’s for a quick coffee [with a lil something extra for those of us who only had to walk home!!] We talked about our initial plan for the day compared to what really happened. If all had gone according to plan, it would have been a bright sunny day and Stacey could have worked her photographic magic under ideal circumstances. The busses wouldn’t have been cancelled and poor June wouldn’t have been carsick. The Snowflake Kingdom would have been kickin’ at Jacques Cartier Park and Kina and I would have remembered our skates for a quick sprint down the Canal. But, so what? Plans change. We could have had a crummy day and let our moods plummet but we didn’t. We rolled with it and guess what? It was fun! Maybe even more so because we were in it together. And that’s exactly what Haven Mavens is about. Friends who have each other’s backs, exploring the world and making memories. Perfect is boring. We hope you’ll join us as our perfectly imperfect journey unfolds. 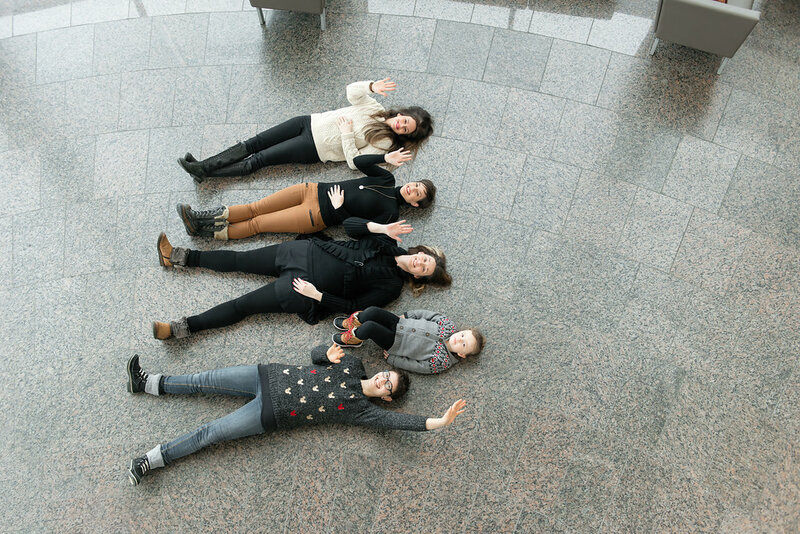 Now that you’ve met us, find out what it’s like to work with us. After a hard day’s work, we take our client on a Tulip Fest food safari.